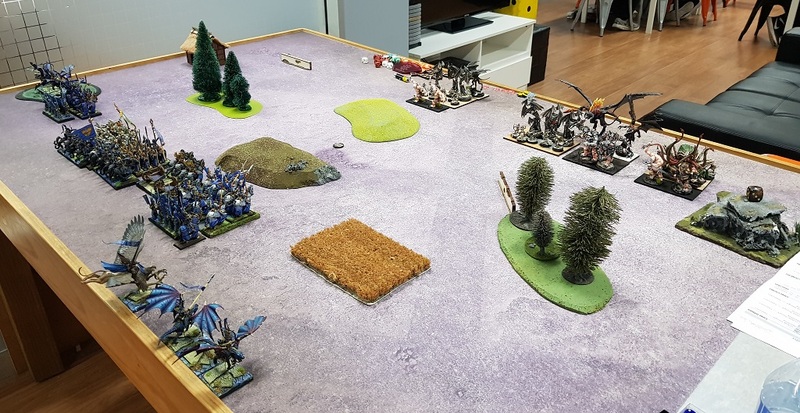 In this battle report I will describe the game I had against another living legend of wargaming, Charles. I had a chance to play against him only once before and it was a few years ago. Charles has recently won Briscon tournament with his melee orientated Ratkin army but for our game he brought something different. 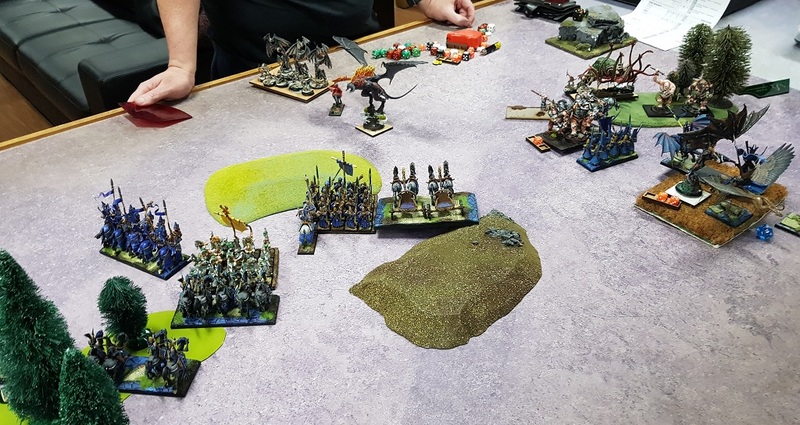 He is currently in the process of basing and modelling his impressive collection of Lord of the Rings models into Kings of War army. 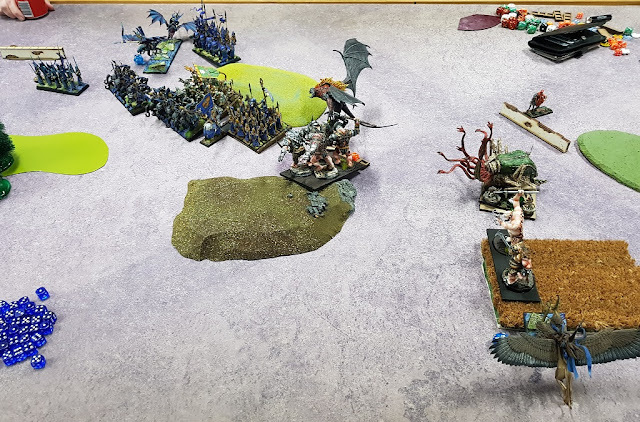 This time he created a list from Forces of Nature faction but the modelling theme is Mines of Moria. As he explained, the idea is to have bases with underground water flowing. There are some interesting ideas about the models to represent units too. In addition, we decided to test the rules for the upcoming local event called Kings of Capitol 2 . This is quite an interesting tournament because this time armies have to be composed without magic artifacts or allies. 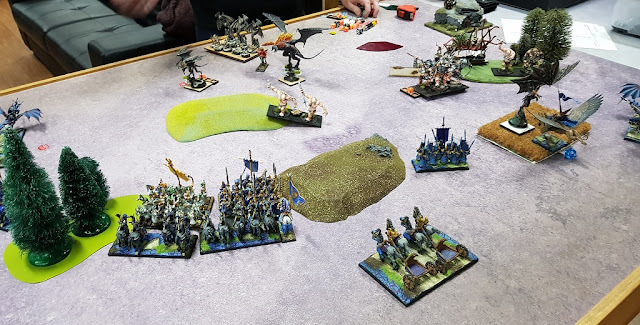 Hence, I had to review my usual army list too! This army is an illustration of the principle Charles has for Kings of War, i.e. this game is about Unit Strength. It is due to the fact that majority of scenarios in Kings of War are Unit strength based. 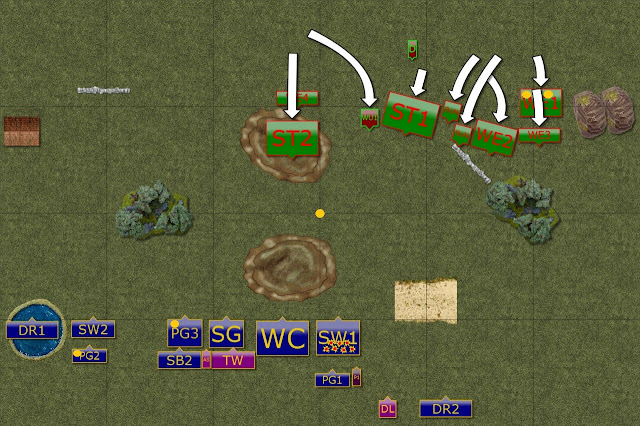 In addition, after the updates from CoK2018 the control over objectives or battle field areas is also determined by Unit Strength rather than the number of units. For example, a single horde will still have the control over the objective even if the enemy had two troops nearby. Hence the core of the army is comprised of two hordes and two regiments of Water Elementals. I personally think this type of Elementals is under represented. They are very good in my opinion because they are fast, even with Shambling. They are resilient, due to defense 5+ and regeneration 5+. They have Crushing Strength that always helps to get some damage done. 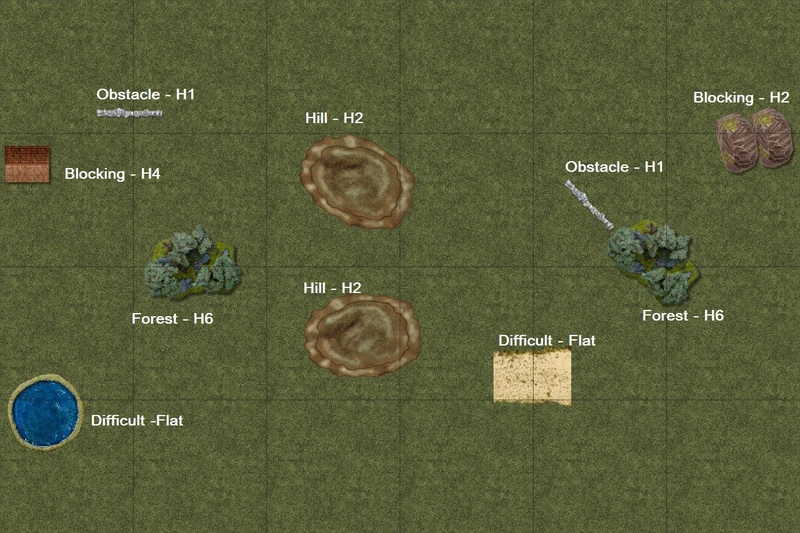 They have Pathfinder so that they don't get hindered by the difficult terrain and they cannot be wavered either. Having a Druid with Surge in the army also adds to the already impressive flexibility of these units. Two hordes of Sylph Talonriders provides fire support but also adds a lot to the flexibility of the army. They are fragile with defense 3+ and as fliers contribute only Unit Strength 2 for horde but they provide very good fire support. Their effective range is 34" and because they fly they can position themselves better for the shooting without penalties for movement. With the most recent update they got their number of attacks increased to 16 for horde unit and that is quite a significant number of dice. They can be very good at eliminating enemy support units. But if they focus their fire they can also be dangerous to heavy armored units too. In addition, they can also be very good at adding support in crucial fights as if they can attack from flank or rear the sheer number of attacks will result in damage. Especially, that unlike some shooting fast cavalry units, they hit on 4+. Two beasts of nature add to the potential of the army greatly as well. They were upgraded heavily but that allows them to be extremely flexible. Just the fact that the opponent has to deal with two flying monsters means that they can attract a lot of attention. With 7 attacks, Pathfinder, Vicious and Crushing Strength (2) they will do damage no matter what. But they also have Lighting Bolt (6) each and that can be very handy at any stage of the battle. Especially when combined with other shooting. The army has only two sources of inspire but with quite compact formation perhaps it is exactly what it needs anyway. Druid is a typical, flexible supporting hero that provides inspiring presence and supports with either bane chant or surge spells. Winged Unicorn, however, has much wider range of abilities to use. It can support the units with the inspiring presence and Heal (7), it can add to melee with 4 attacks with Thunderous Charge (2) and it can also add to the shooting abilities of the army. 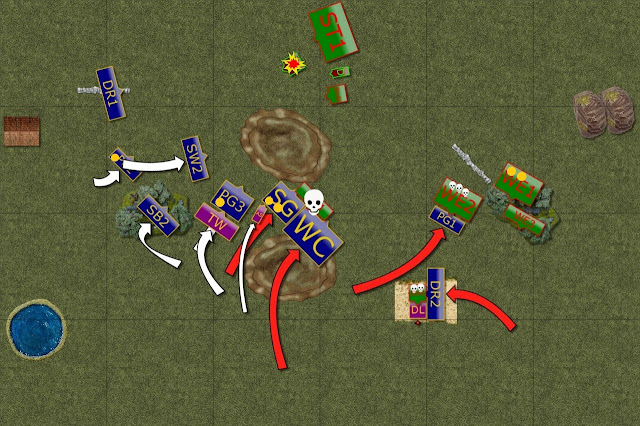 In general, I faced the army with 10 elements total which meant I had a bit of an advantage in the number of units. However, almost all elements had either good defense, good nerve or both. It would not be easy to rout any one of them unless I could focus my attacks well. The army has a lot of flexibility and can move from defense to attack instantaneously. It can afford to be patient, shoot and weaken the enemy before committing to the melee. I wanted to focus on the shooters first because they can cripple my small units. Even a single Lightning Bolt (6) has a potential to rout or waver any troop I have. My aim was to use terrain and mutual support to get as much cover as possible. I knew I have to be careful with my advance because any flying element could potentially attack on its own and rout some of my more fragile troops. Especially if they got hit by ranged attacks before. However, with a bit of an advantage in the number of units I thought that as long as I can go for exchange of units and make sure that if I lose one I can rout one of the enemy, I may have a good chance to prevail. In order to be prepared for that I needed my units to support each other closely. Another element I hoped to use to advantage is that I expected this army to keep compact formation due to lower numbers and two inspiring heroes. In addition, although Water Elementals are fast and have good charge range, they also Shamble. That means that there is always a dilemma: to keep the fliers nearby but not use their maneuverability to the full potential or let them loose but risk them being unsupported. I removed all the magic artifacts and one of the flying princess. That created an opportunity to get back Palace Guard regiment to the list. However, I still have some points to spend and decided to try something I don't usually do. A living legend unit. I like Silver Breeze a lot and I really liked the new unit description, The Windborne. They come equipped with Windblast (8) spell but they still roll for damage with all the hits. The disadvantage is that the spell has 18" range. However, as it is a spell and this one was not listed in CoK2018 as the one that is affected by stealth or cover, the unit always hits on 4+. Hence, one can expect to push enemy units by 4". In addition, they still can do a bit of a damage too. I was a bit short on Inspiring sources and I was concerned about it but decided to give it a try. Based on the assessment I made before, I decided to keep my shooters together and fast cavalry in the second line to provide cover. The Windborne would not be affected and regular Silver Breeze could use the mobility to move to terrain instead. In this way I hoped to have a single target in range for all my shooters and hopefully that would be enough to cause significant damage every turn of shooting. The deployment of the army as a whole would depend on the scenario however, so I didn't want to make any plans prior to the roll for it. 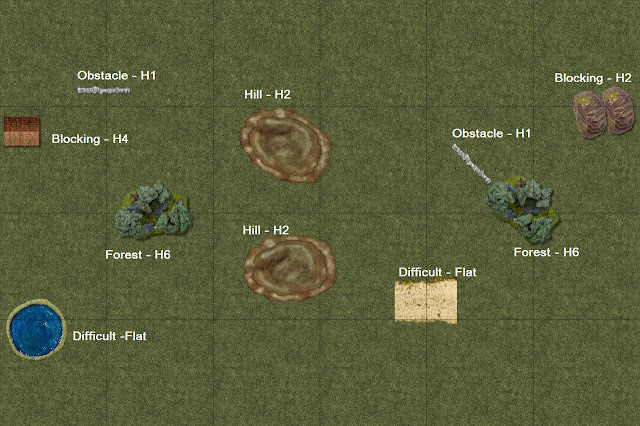 In order to determine the terrain set up I used fantastic map pack from Epic Dwarf. In this game we used Map 11 as a reference. 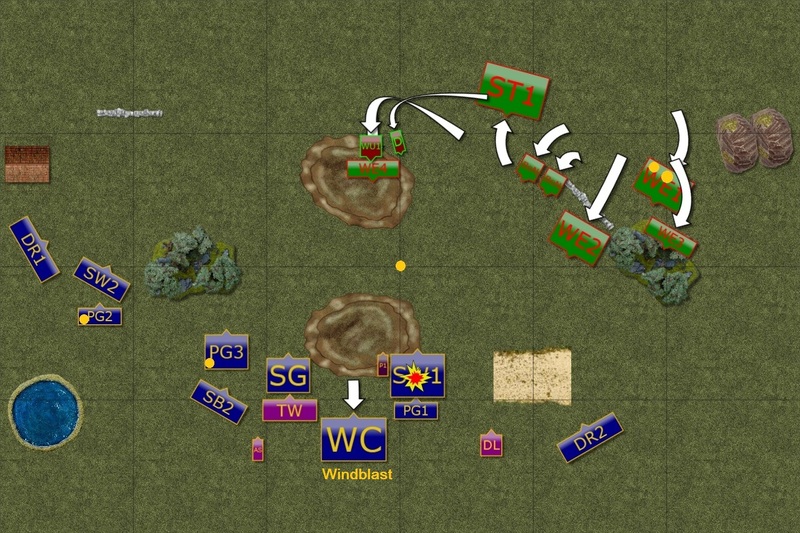 Deployment and allocation of Loot tokens for Push scenario. We got Push scenario (again for me, as my previous game had the same!). As expected, Charles deployed his army with the refused flank. He focused on one side to protect one horde of Elementals to deliver the tokens to my side of the battle field. He also used some elements to contest the token in the middle and I expected that the units from the flank would go around to fight for it too. After all, you don't need to collect all the tokens to win the game, you just need to have more than your opponent. Since head on fight and war of attrition favors Water Elementals, I wanted to avoid it. Because of that I didn't deploy my units directly across the unit with the tokens. What is more, they would be going through the woods and that means favorable ground for Pathfinders as well. However, I didn't want to leave that door completely open and I deployed drakons and the lord on that flank. Mindful of the shooting potential I also put them far back to avoid first round shooting. I deployed the bulk of the forces in the center. The shooters as planned and also because that would give me flexibility in turning towards any flank. It is often the group I deploy early so if I do that I position them in the center and see what is the rest of the enemy army doing. I decided to place Storm Wind regiment on the center right to keep in check advancing elements of the opposing army. They would easily stay out of range and be able to shoot but it still limits the options. 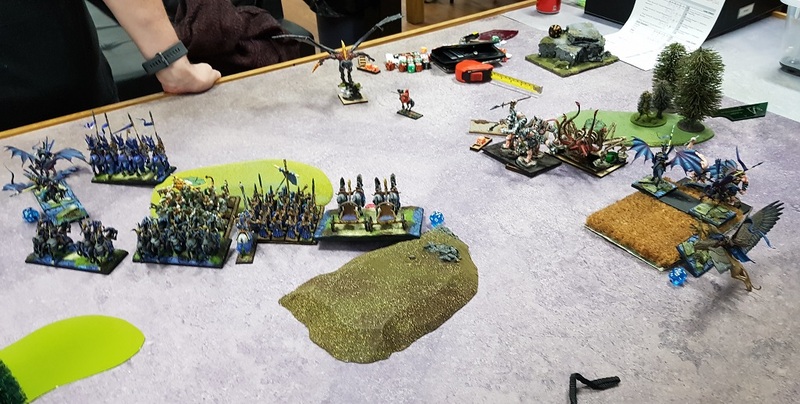 Even beasts of nature may be reluctant to get charged by the heavy cavalry regiment in the open. I also placed small contingent on the left because I could not have them close enough for Inspiring Presence. 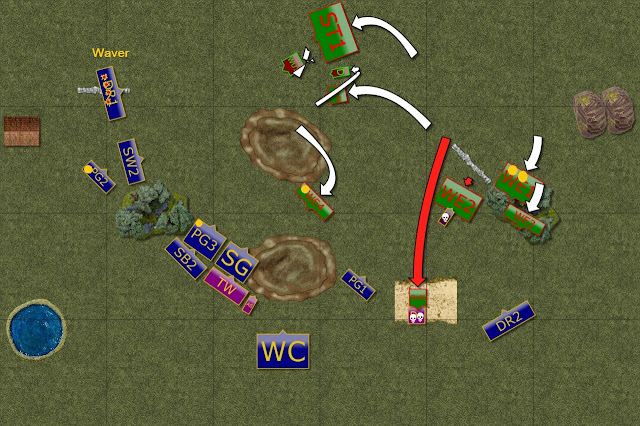 Hence, I wanted to avoid them being shot at early and use their mobility to move around the flank unmolested. I also placed small unit of Palace Guard there to carry one loot token. 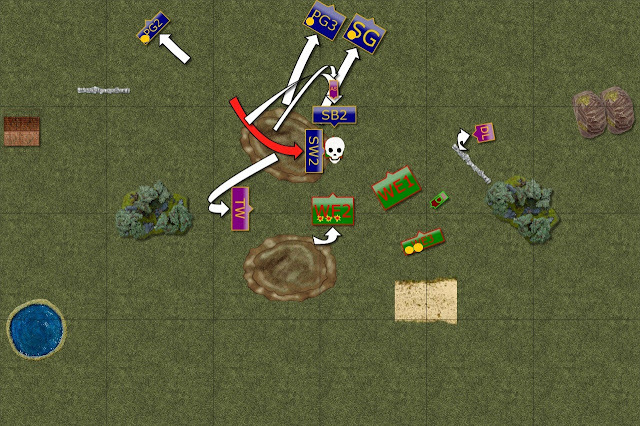 Perhaps I should have also placed second one there but decided to split the tokens in case the enemy fliers decided to move to the flank and start shooting at my vulnerable troop. 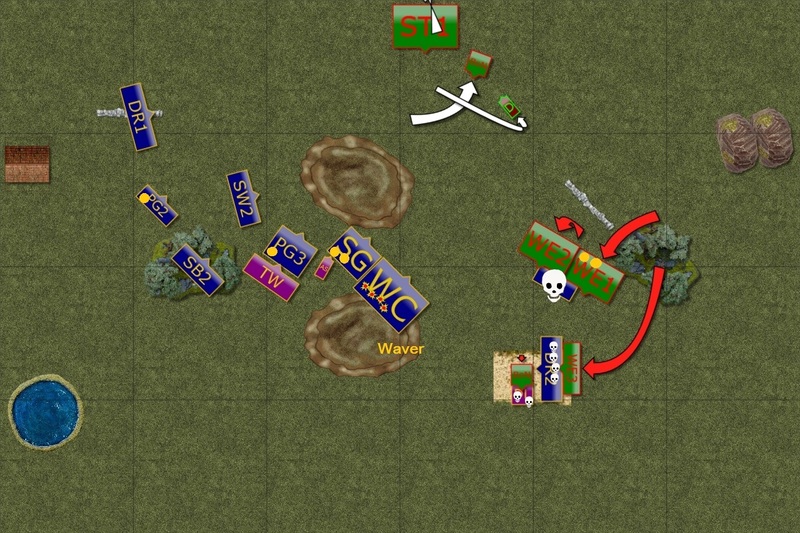 In the end the plan was to try and slow down as well as occupy main enemy forces on my right, use the shooting to inflict the damage in the center and contest the loot token there and use the units on the left for wide outflanking maneuver. If the center does expected damage and if the right can hold long enough then I hoped to get into positions to keep my tokens safe and grab the middle one too. While at the same time prevent the enemy units from taking these three away from me. Charles won the roll off and chose to go first. The Water Elementals shambled forward while other, much faster elements of the Forces of Nature army positioned for the first round of shooting. All ranged attacks were aimed at the regiment of Storm Wind cavalry. After the hail of arrows and lightning bolts, the Elven knights stood proud but they did suffer significant damage. Elves advance in close formation. 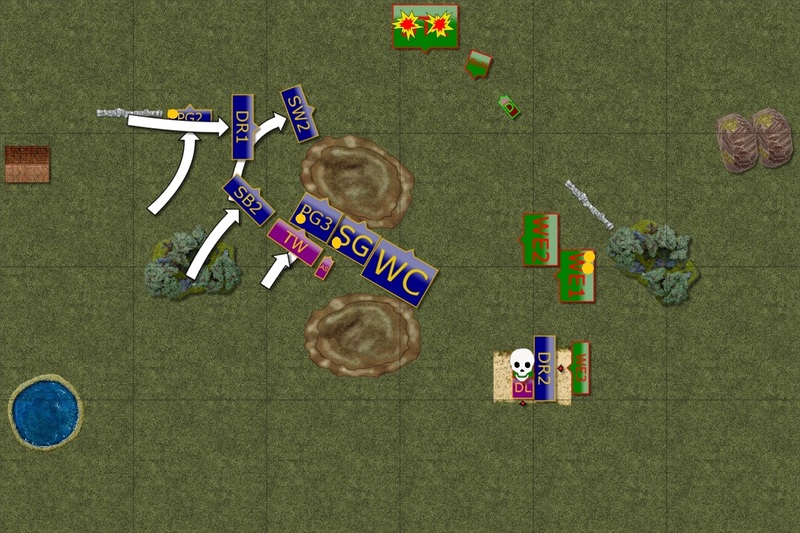 Sylph Talonriders are shot down from the skies. Elven army advanced as well. The units on the left at higher speed and those in the center only to get into effective range for the shooting. They focused on the Talonriders and inflicted enough damage to rout them already! 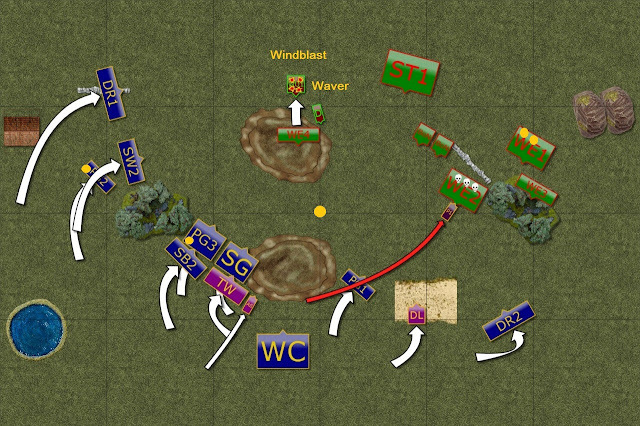 The Forces of Nature continued their advance on the right as well as lightning bolt barrage against Storm Wind cavalry. This time even the Elven Knights could not hold against such a concentration of ranged attacks and were routed. Elves continued their advance on the left flank as well as in the center. With one Talonriders unit gone, the shooters focused on the Winged Unicorn. Although not eliminated yet, it was badly wounded and pushed back. At the same time, the Prince felt quite heroic and charged Water Elementals all by himself. It was to buy time for other units to advance to positions for the second wave of the attacks. Water Elementals claim the central token. The Beast challenges the Drakon Lord. The Forces of Nature divided their units into two groups now. 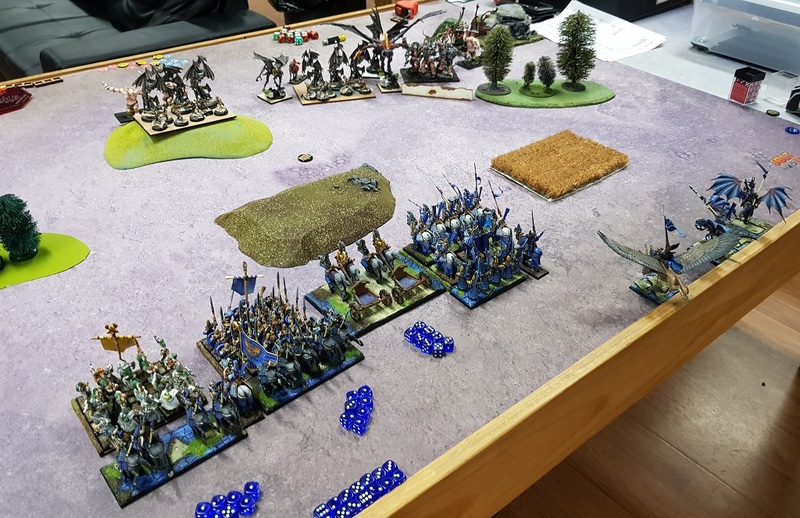 One moved to attack advancing Elven forces on the flank and the shooting was efficient enough. 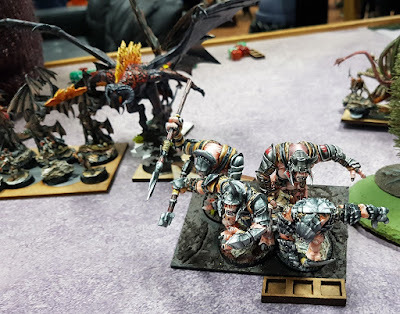 Drakon Riders were wavered and would not move for now. The second group kept advancing into the enemy territory. The attack was spearheaded by one of the Beasts that charged the Drakon Lord. Sea Guard carries one token only - apologies for confusion. Elves decided to attack the Water Elementals in the center and combined effort of Sea Guard and War Chariots was successful. The Enemy unit was routed and the loot was claimed. 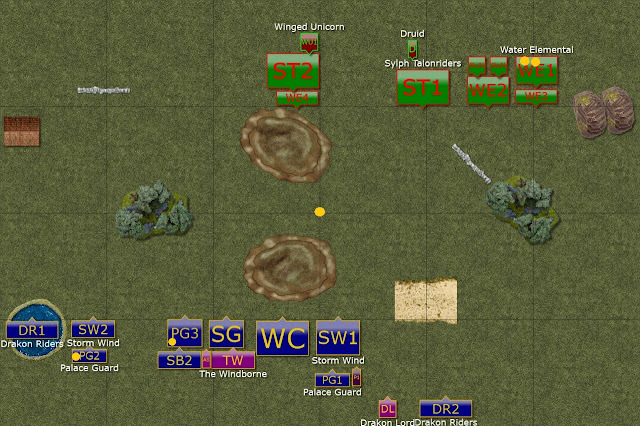 The fast cavalry kept shooting at the wounded Unicorn and this time it perished for good. At the same time units on the right committed to the fight. Palace Guard charged Water Elementals to block their advance but Drakon Riders failed to rout the Beast of Nature. That meant they would now had to brace for the impact and the counter attack of the Water Elementals regiment. Palace Guard vs Water Elementals. Forces of Nature counter charge. Water Elementals counter charged. First the valiant Palace Guard could not hold against combined might of two hordes of the enemy and only slowed their advance a little. 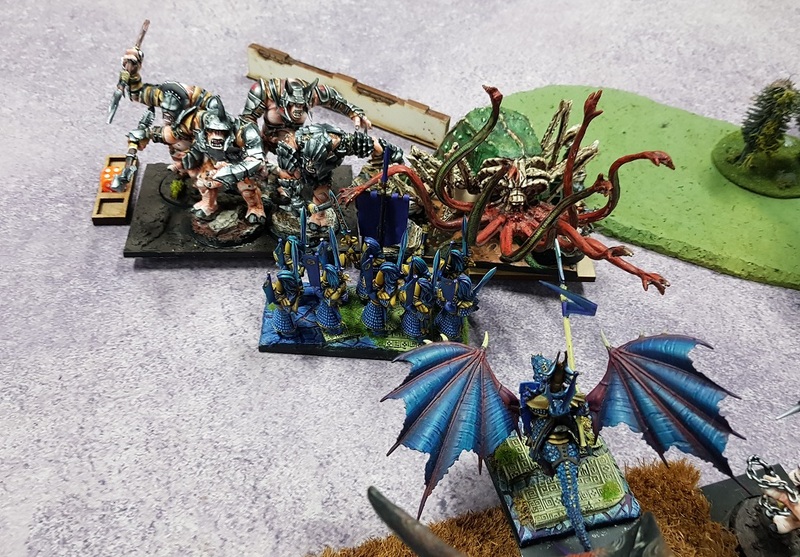 Then the regiment somehow failed to rout or waver the Drakon Riders while the Beast of Nature continued fighting against Drakon Lord. In the center, the shooting of Talonriders and lightning bolts wavered elven Charioteers. The fight was entering decisive stage. Two more enemy units down. 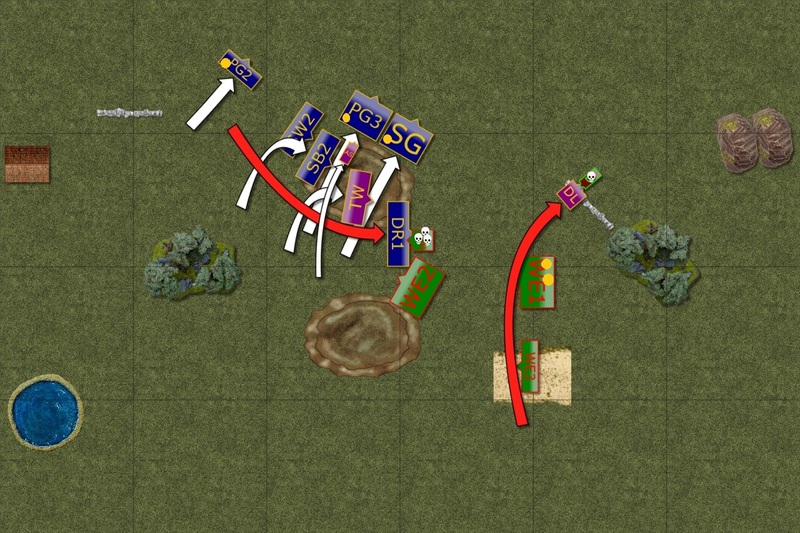 Despite the losses, Elven army still had a significant potential to deal damage as well. First the shooters used the opportunity to target second unit of Talonriders and they were routed. 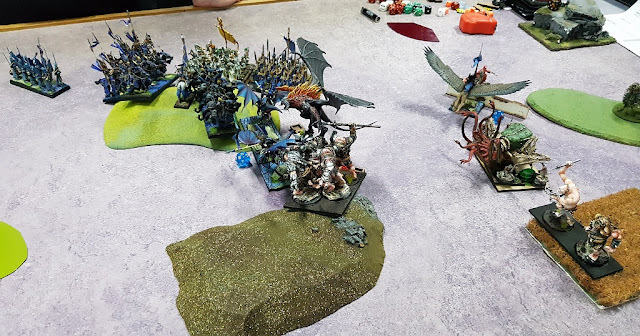 Second, Drakon Riders used the chance to fight one more turn and together with the Drakon Lord they finally managed to bring one Beast of Nature down. Elves take casualties again too. With the shooting capabilities significantly reduced, Forces of Nature resorted to brute force now. Water Elementals were surged by the druid to hit the flank of the War Chariots. Beast of Nature attacked the chariots too in order to get to the good position to threaten other Elven units. 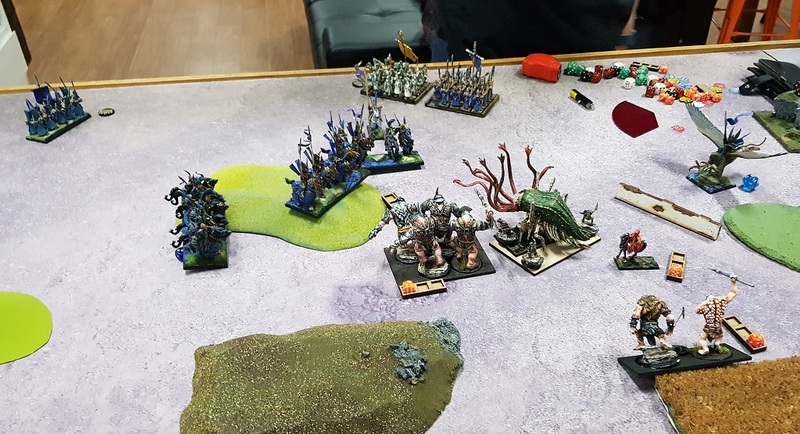 Last but not least, Water Elemental regiment finished off badly wounded Drakon Riders and shambled forward, ignoring the Drakon Lord completely. Running away with the loot. All infantry regiments were now running away with the loot while the rest of the army performed delaying actions to slow down the enemy. 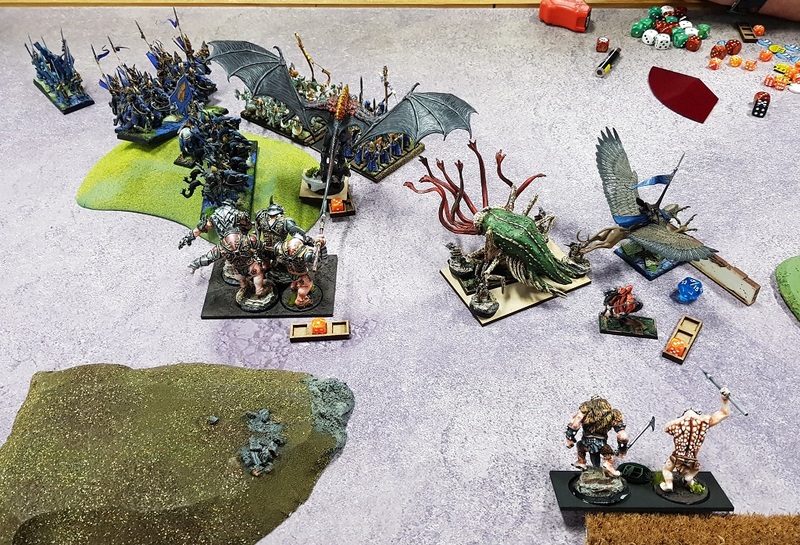 First, Drakon Lord attacked the Druid despite temptation to charge exposed flank of the Elementals. It was due to the fact that by doing so he could prevent the Druid from assisting the elementals and pushing them forward with Surge spell. Next, Drakon Riders attacked Beast of Nature to pin it to the ground and prevent it from attacking the Guards units. 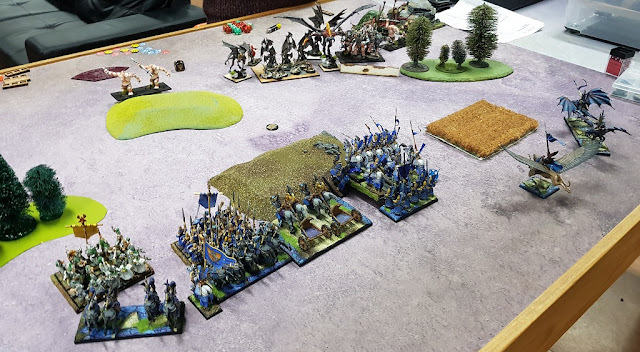 In the confusion of the battle, the fast cavalry positioned itself to shoot at the Druid, only to find out he was already engaged in the fight! Water Elementals trying hard to catch the Elves. The Elves were slowed down by the Loot so Water Elementals were prompted to catch them. One horde flank charged the Drakon Riders and routed them. Beast of Nature ignored the enemy flyin cavalry and moved after the infantry. 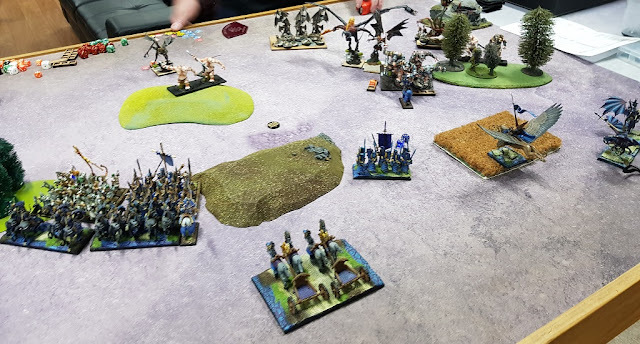 The second horde of Elementals dropped their loot and moved at higher speed towards the Elven units. While the regiment behind moved to pick it all again. Beast of Nature is down! 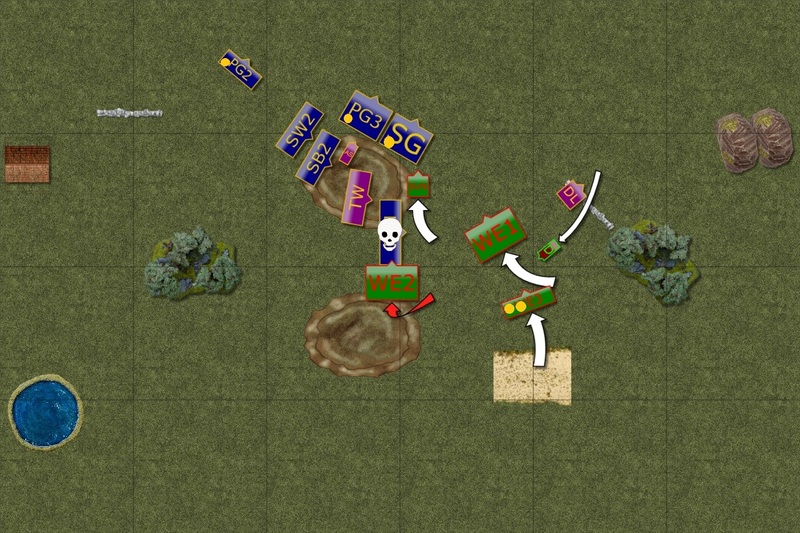 Elven infantry continued running away with the Loot. Storm Wind cavalry flnk charged the Beast and managed to bring it down! Nearby Silver Breeze was blocking the path anyway but it was a success nevertheless. However, Elves just managed to avoid a disaster of being attacked by the wave of Water Elementals. 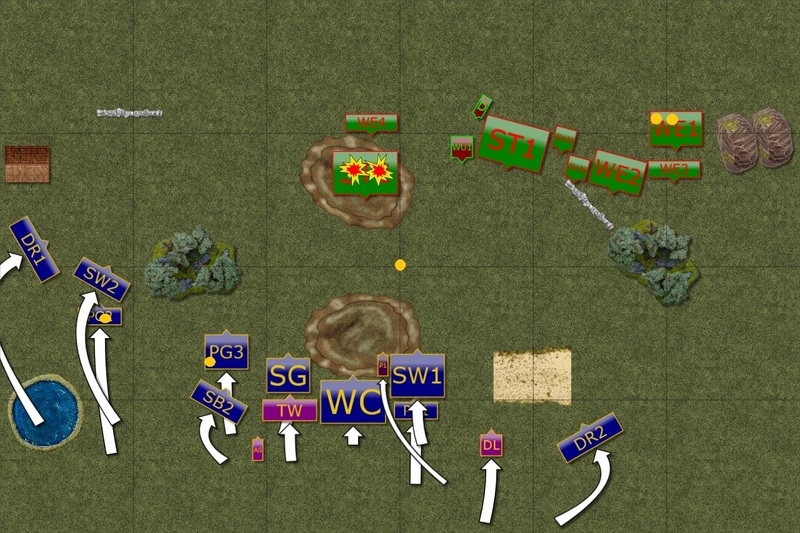 Forces had to abruptly disengage and if the battle continued a bit longer the end would have been quite different! Many thanks to Charles for reaching out, offering the game and playing the great battle! It was fantastic to play after so many years again and I am happy he is back to wargaming, in particular to Kings of War. I must say that after two games versus Jeff and Charles I had one very important observation. There is very little players of their caliber miss and if there is a flank charge they offer it means they are fully aware of that. It may, in fact, be a trap! :) So while I am sure both of them have a few things they would have done differently, one should not count on them to make any mistakes. Which is absolutely fantastic to be able to play against them as once can learn a lot in the process. When discussed the game afterwards, Charles mentioned a few things he would have done differently. 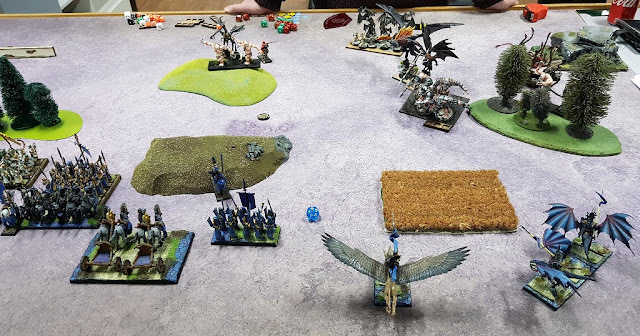 First, he said he probably moved Talonriders in the first turn too far forward. That allowed me to concentrate fire on them and rout them in a single turn. Perhaps being a bit more patient with them would have been better. Second, Charles planned to pick the middle token and stick there for one turn with his Water Elemental regiment. Unfortunately, his Druid was not in ranged to Inspire them and they were routed. I rolled the dice again to see what would have happened and with the re-roll they would have stayed! However, I attribute such overlooks to the fact it was his 3rd game with this particular list and even for an experienced wargamer there is still time to get used to new force. I think my units on the left moved in a way that took too long. Once I saw that the enemy is focused on the other half of the battle field I could have moved Drakons towards the wood instead. That would have brought them to the center of the field, be in range for inspire from Army Standard and have some cover from shooting too. I would have not committed the Prince the way I did again. I think I lost him for no gain really. He would have been more useful later in the game where I needed fast, maneuverable individual to chase the Druid. I also didn't not position my Palace Guard well so that when Beast attacked the Drakon Lord they could not help. Drakon Riders did not do enough damage to the beast to rout it either. I think I overestimated their ability to do so. I needed more than average amount of damage they can do in the situation like that in order to have a good chance to rout the Beast. It was not too bad but I was simply lucky they didn't die when water elementals attacked them from the rear and that I could attack the beast again. But the most crucial mistake was not to block the horde (WE1). If the game did not end on turn 6, they would have charged the rear of the Sea Guard carrying the token. I need to remember that units can drop the loot and immediately move at normal speed. There were a few things I could have done better. First, move the Windborne earlier so that I could shoot at the unit and keep pushing it back. Second, even landing with Drakon Lord in front of them would have prevented any hostilities if there was turn 7. And third, I could have pivoted towards the left and use the hill as a cover too. It would have been such a shame if I lost the game due to a silly mistake like that! Dice where quite gentle with me this time but I need to be focused next and do not make such mistake again! I must add I am really happy with the Windborne cavalry. The combination of 8 dice that always hit on 4+ , push enemy away and on top of that I can still roll for damage is just great. Very useful unit and I will do my best to make room for them in the regular list too. I think this spell has a huge potential and it is a matter of learning how to use that unit to the fullest. Thanks! Although there were only two games in a row I am still very happy with the results. Both were great against fantastic opponents, I learned a lot thanks to that! The windborne are so, so good. I’ve played against them multiple times, and they always do something incredible. It takes a lot of practice to get the full potential of them, but I think they could do very well in your list if you choose to use them going forward. Reading your reports definitely has me missing playing an army with decent shooting! I may have to dust off the Twilight kin in a bit! I know that shooting can be quite impressive sometimes but remember I was shooting at Defense 3+ units here. Although ranged attacks are important part of my list they would not contribute to the end result alone. It is combining them with maneuverability of the army and melee abilities that make this army so much fun to play with!